Benferri is the small village situated in the triangle between Orihuela, Murcia and Alicante in Spain. Benferri is a delightful village to visit. The history of Benferri goes back to the wars between the Romans and the Carthaginians and later between the Christians and the Moors. Under the long Arab occupation there were many technological advances including the building of walls, wells, dams and irrigation. The cultivated land increased and improved crop yields. In 1242 under the reign of the Castilian king Fernando III "The Saint" the village became known as Benferri. Since then, Benferri family was related to Rocamora, who after accompanying Jaime I of Aragon in his campaign of conquest of Valencia, obtained these lands reward for services rendered in the war. In 1464, Juan Rocamora bought the estate and Rocamora tower. In 1494 the village consisted of a tower, but Jaime de Rocamora began to populate the area making houses and attracting families, work continued by his son Jeronimo de Rocamora, who thanks to the fortune he had earned their financial activities, managed the settlement of 29 families. 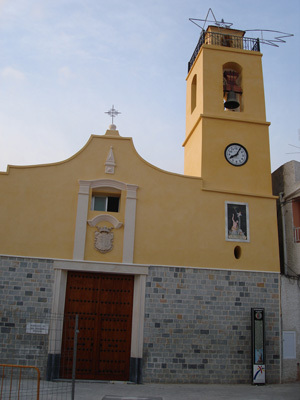 In 1622 the church of San Jeronimo, the Patron Saint of Benferri, was constructed under the protection of the Rocamora family, a late Renaissance style. Benferri’s shield has a blackberry branch with a golden tower -symbolizing the most important milestones of the small village, whose main economic activities are construction work and agriculture. Today, in the village plaza is the Town Hall and its traditional fountain. There are plenty of seats where you can relax amongst the pretty trees, shrubs and flowers and watch the world go by. The village are many parks and despite only being small, Benferri does have shops and most importantly bars and restaurants. The Patron Saint feast day is held in September in honour of San Jeronimo with a open air celebrations and a procession. The rural tranquility of this small village, together with the proximity of the coastal areas of Orihuela, Torrevieja and the Mar Menor and the sunny micro-climate, Benferri is an ideal place for a number of foreigners, mainly British and Germans, who have moved their home here. See below to view a selection of our bargain properties in Benferri.